Purpose: The purpose of this study was to explore the students' perspectives on the phenomenon of online learning communities while enrolled in a graduate dental hygiene program. Methods: A qualitative case study method was designed to investigate the learners' experiences with communities in an online environment. A cross-sectional purposive sampling method was used. Interviews were the data collection method. As the original data were being analyzed, the researchers noted a pattern evolved indicating the phenomenon developed in stages. The data were re-analyzed and validated by 2 member checks. Results: The participants' experiences revealed an e-model consisting of 3 stages of formal learning community development as core courses in the curriculum were completed and 1 stage related to transmuting the community to an informal entity as students experienced the independent coursework in the program. 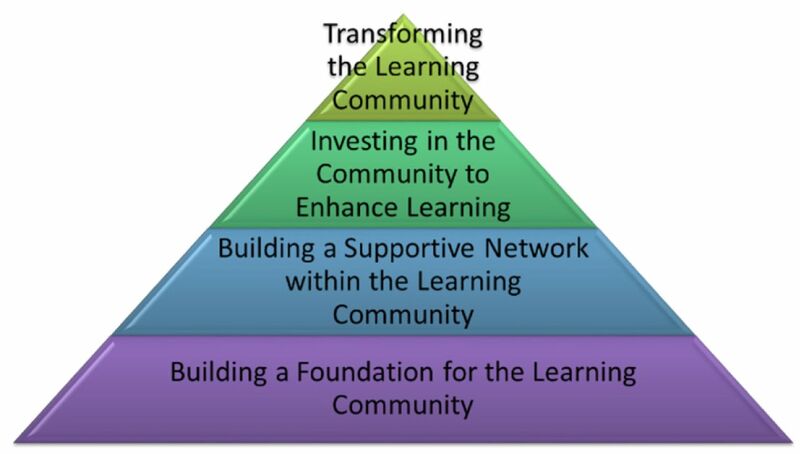 The development of the formal learning communities followed 3 stages: Building a Foundation for the Learning Community, Building a Supportive Network within the Learning Community and Investing in the Community to Enhance Learning. The last stage, Transforming the Learning Community, signaled a transition to an informal network of learners. The e-model was represented by 3 key elements: metamorphosis of relationships, metamorphosis through the affective domain and metamorphosis through the cognitive domain, with the most influential element being the affective development. Conclusion: The e-model describes a 4 stage process through which learners experience a metamorphosis in their affective, relationship and cognitive development. Synergistic learning was possible based on the interaction between synergistic relationships and affective actions. Online learning opportunities in higher education have evolved from individual course offerings to entire degree programs. However, research has continued to focus on the development of learning communities in a single course during 1 semester. Liu and colleagues suggested that building learning communities is a “complex sociocultural phenomenon” requiring a longitudinal focus to determine the development of this phenomenon over time.7 Therefore, the literature reviewed was focused on the phenomenon of online learning communities over the course of an academic program or a cross-sectional approach to data collection using multiple levels of students enrolled in a program. This approach to the literature review was deemed appropriate to establish a holistic perspective of the phenomenon. The purpose of this study was to explore the student perspective on the ebb and flow of learning communities in a graduate dental hygiene program. Educators who taught in the program noticed the development of community among many of the learners and thought it would be beneficial to examine the students' experiences of how this phenomenon occurred throughout the program. A qualitative case study method was designed to investigate the experiences of learners with communities in an online environment. The context for this case study was an online graduate program located in a northwestern U.S. university which awards a Master in Science degree in Dental Hygiene. Students attended a week-long on-campus orientation before beginning the core courses related to program development and evaluation, special needs populations, leadership strategies, research and advanced dental hygiene theory. The program requirements included the selection of a specialty in dental hygiene education or community health. Each specialty area consisted of 2 didactic courses, 1 elective course and a practicum. A second week of face-to-face interaction on-campus was required for a seminar course with topics relating to practice, education and research. Students enrolled in the seminar to prepare for the research course and the subsequent thesis experience. All core courses and emphasis area courses were provided using an asynchronous format to accommodate the different time zones in which students lived. The university's Internal Review Board approved the research protocol before participants were recruited. The purposive sampling method was employed to gain students representing a cross-section of progression in the program who were experiencing the phenomenon at different levels, as well as graduates who would be able to provide a retrospective view of the phenomenon. Personal interviews were conducted by a graduate of the Master's degree program after participants signed the informed consent form and selected a pseudonym to protect their confidentiality and anonymity. Participants received a copy of the interview questions 1 week before the in-person or telephone semi-structured interview. The audio data from the interview were recorded, transcribed and verified for accuracy before the second researcher analyzed the data. The data were collected for the original purpose to determine the factors promoting and impeding the development and sustainability of online learning communities throughout the graduate program.6 However, as these data were being analyzed, the researchers noted a pattern that evolved indicating the phenomenon developed in stages. As a result, all 17 of the transcripts were reanalyzed with the new purpose in mind. The first round of data analysis was conducted by deconstructing the data into initial codes representing the actions apparent in the data.10 Initial codes were provisional, as a place to begin the analysis.10 Open codes have the potential to change as the researcher uses the constant comparative method to determine similarities and differences in the data collected from multiple participants.10 Therefore, each interview was analyzed and initial codes were compared to those established during the analysis of the other interviews. The second round of data analysis and focused coding allowed the analysis to create conceptual categories that represented multiple open codes.10 Throughout this process, the researcher wrote memos to raise questions about the analysis and relationships among the categories. The interviewer served as a peer reviewer to help answer the questions raised and determine relationships based on her experience in the program. In the third and final round of data analysis, the researcher focused on the relationships among the categories.10 This relational analysis resulted in organizing the data into categories named as stages of online learning communities, subcategories reflecting supportive themes in each category and actions participants experienced in each subcategory. After the data analysis was completed, the results written and a figure of the model developed, the validity of the analysis was verified by conducting member checks. Ten participants completed a review of this information to ensure the credibility of the researcher's interpretation of their experiences. In addition, 2 students who were in the online program, but not participants in the original study, were asked to read the results and provide feedback comparing their experiences in the program to the data analysis. Some comments made by the individuals about the fourth stage of the e-model from the first round of analysis caused the researchers to re-analyze the transcripts related to this final phase and develop a more accurate interpretation of the participants' experiences. A second member check was completed by current MS students who had completed 1 year of the program and graduates to provide feedback on the revised e-model. Nine individuals responded to the revisions in a positive manner and no additional changes were made to the analysis. The participants lived in all regions of the U.S. (n=17). The entire sample was female; 2 students were in the first year of the program, 6 students comprised the second year level, 4 students from the third year level and 5 participants had graduated from the program. The analysis of the qualitative data collected from the participants revealed 4 stages of online learning communities throughout the graduate program. Participants progressed through 3 stages of formal learning community development as they completed the core courses in the curriculum and 1 stage related to transmuting the community to an informal entity as students experienced the independent coursework in the program. The development of the formal learning communities followed 3 stages: Stage 1: Building a Foundation for the Learning Community, Stage 2: Building a Supportive Network within the Learning Community and Stage 3: Investing in the Community to Enhance Learning (Figure 1). The last stage was Stage 4: Transforming the Learning Community, which signaled a transition to an informal network of learners. The first stage of community development, Building a Foundation for the Learning Community, revealed 3 subcategories and actions to achieve each subcategory (Table I). The Initial Connection was the first subcategory of Stage 1. The actions experienced by participants consisted of meeting peers and faculty face-to-face at the on-campus orientation, sharing common experiences during the on-campus visit and connecting with new peers in courses throughout the program. Stage 2 of developing the online community was Building a Supportive Network within the Learning Community. Three subcategories and corresponding actions were revealed from the interviews (Table II). Developing Interconnected Learner Relationships was the first subcategory of the second stage. Participants' actions included being open to developing relationships, establishing commonality and developing feelings of closeness and caring. One action related to building interconnections among learners was being open to developing relationships, “It is up to the individual to take advantage of those opportunities for interaction. I mean we all live in communities physically, but we never know our neighbors unless we do our part, unless we extend ourselves to learn from them and learn about them. The opportunities are there and it's up to us” (April). Feelings of closeness were voiced by Sally, “I consider myself as a member of a family and from my perspective it was definitely as a class” and Tango discussed feelings of caring, “We were not afraid to be personal and to share experiences because we knew we were sharing them with people who cared.” These feelings of being connected were developed “by sending personal emails, making phone calls and by sharing, calling and asking how are you doing or sharing progress and asking about how your family was or how things were going” (Patsy). The third stage of online community development constructed from the data was Investing in the Community to Enhance Learning. This stage revealed 2 subcategories, Collaborative Interaction and Synergy Creation and 2 actions within each subcategory (Table III). The last stage in the online graduate program was Transforming the Learning Community (Table IV). The final stage's subcategorieswere Absence of the Formal Peer Network, Construction of an Informal Learning Community and Adaptation of the Informal Learning Community. The creation of the 4 stage e-model resulted from the inquiry of the online learning community phenomenon experienced by dental hygiene students in a graduate program using a cross-sectional approach to data collection. The data analysis revealed an e-model consisting of 3 stages representing a crescendo in the development of formal learning communities, while the last stage described the formation of informal learning communities and lifelong collegial relationships. Formal learning communities were created over the semester time frame in the core courses of the graduate program during the interaction required of learners in the weekly discussions or activities. Informal community development was necessary when learners progressed to the independent course experiences, practicum and thesis courses, in the graduate program and no longer participated in required weekly discussions. Informal communication through back channel means (e.g. telephone calls, email, social networking sites) was vital for re-establishing a supportive network within the program and beyond graduation. The e-model extends the understanding of online learning communities as presented by Brown.8 Stages 1 to 3 of the e-model are similar to Brown's stages of meeting, membership and camaraderie. The similar findings might indicate a need for prolonged, intense or face-to face engagement among learners to reach higher levels of learning communities. Brown studied novice and veteran online learners who were enrolled in a graduate course during the fall, spring and summer sessions presented in an asynchronous fashion. However, participants in the e-model study represented a cross-section of progression in an entire graduate degree program and graduates who had a retrospective view of learning communities. In addition to the asynchronous core courses, the graduate program required 2 on-campus visits where students had the opportunity to connect face-to-face with peers and faculty. These differences might explain the development of Stage 4: Transforming the Learning Community, which adds an additional phase to understanding learning communities within an online graduate degree program. The e-model was represented by 3 interrelated key elements over the course of the graduate degree program: metamorphosis of relationships, metamorphosis through the affective domain and metamorphosis through the cognitive domain. The developmental progression through each of the 3 key elements was necessary to reach the highest level of each key element. Figure 2 depicts the hierarchy of relationships as students progressed through the graduate program. Each level represents a developmental change in the quality of relationships. At the simplest level, establishing the initial connection during the on-campus or online meet and greet laid the foundation for connecting to other learners in the community in Stage 1 of the e-model. During Stage 2, learners developed a close and caring relationship, which in turn created a network of interconnected learners portrayed by feeling safe, trust and support for each other. These experiences were important for the development of fellowship portrayed as a supportive network of equals. When learners evolved to the status of being an equal in the learning community this achievement was influenced by their ability to overcome the challenges in the online environment, develop competency in becoming an online learner and participate as a valuable contributor to learning. The fellowship level of relationships is where students developed self-efficacy as an online learner and established an authentic connection with community members. The highest level of relationship development within the formal learning community was the synergistic relationship revealed in Stage 3 of the e-model. This relationship involved the ability of the members to cooperate and collaborate based on the enhanced quality of the interconnected relationships developed through ongoing interaction in the core courses. Students involved in a synergistic relationship were united by working towards accomplishing a common goal and felt the freedom to share their insights for the benefit of the collective group. Synergistic relationships were characterized by the positive energy created by the interconnected learners. 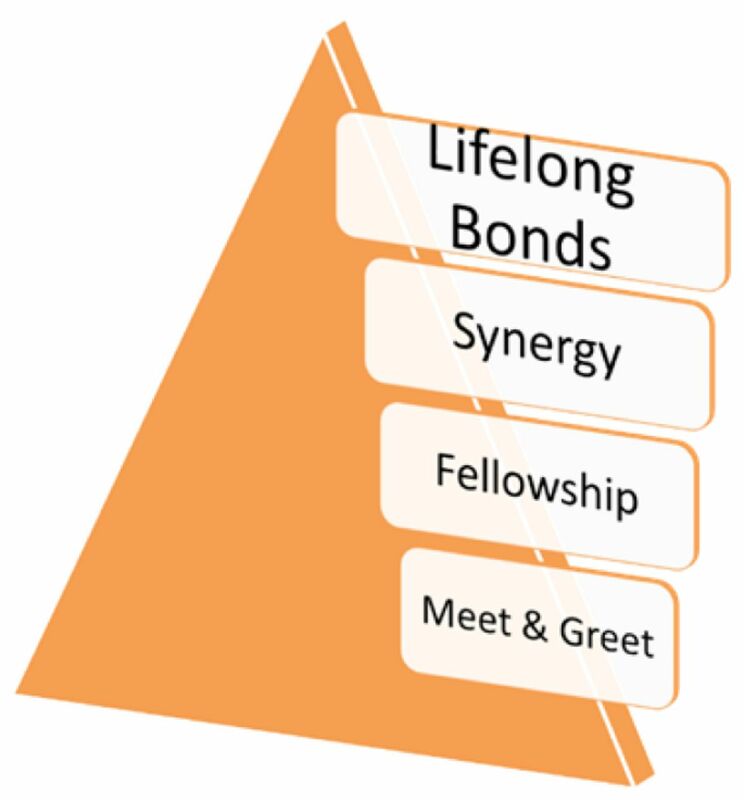 Lastly, lifelong bonds were characteristic of an informal learning community established in Stage 4 where peers and faculty formed collegial relationships that extended beyond graduation. Social interaction is an important aspect of learning and is based on the social constructivist theory.11 The constructivist model is applicable to traditional learning contexts and online situations.5 Specific to online learning, social presence is one of the 3 key components of the Community of Inquiry model.12 Social presence is created by conveying a sense of a real person through affectively expressing oneself, openly communicating and developing a group identity.12 The e-model created from this current inquiry points to a developmental process of relationships, each stage building on the other, in a similar fashion as Brown's model.8 Her level of “membership” characterized by reaching the status of being a contributor to the discussions and others building on those ideas8 is similar to the level of “fellowship” experienced by the dental hygiene graduate students. However, the e-model differs from Brown's model, in that “camaraderie” through making interaction a priority was analyzed as an affective change in the learners' values in the e-model. Synergistic relationships in the e-model had a strong affective dimension, which related to learners valuing each other, caring about and empathizing with their peers and providing encouragement to each other. Likewise, the positive energy created by synergistic relationships influenced the synergistic cognitive development of the community. Emotional support within the online learning environment was revealed as an important factor in the development of relationships in the e-model. Within the online context emotions can affect the learner in a positive or negative manner.18-20 Emotions have been reported in each presence within the Community of Inquiry Model: social, cognitive and teaching.21 More recently the emotional component has been proposed as a separate entity from the other presences; thereby, adding a fourth presence to the Community of Inquiry Model.22,23 In comparison and in addition to emotions and feelings, the e-model exposed a developmental change in values, priorities and actions guided by an internal values system within the affective domain. 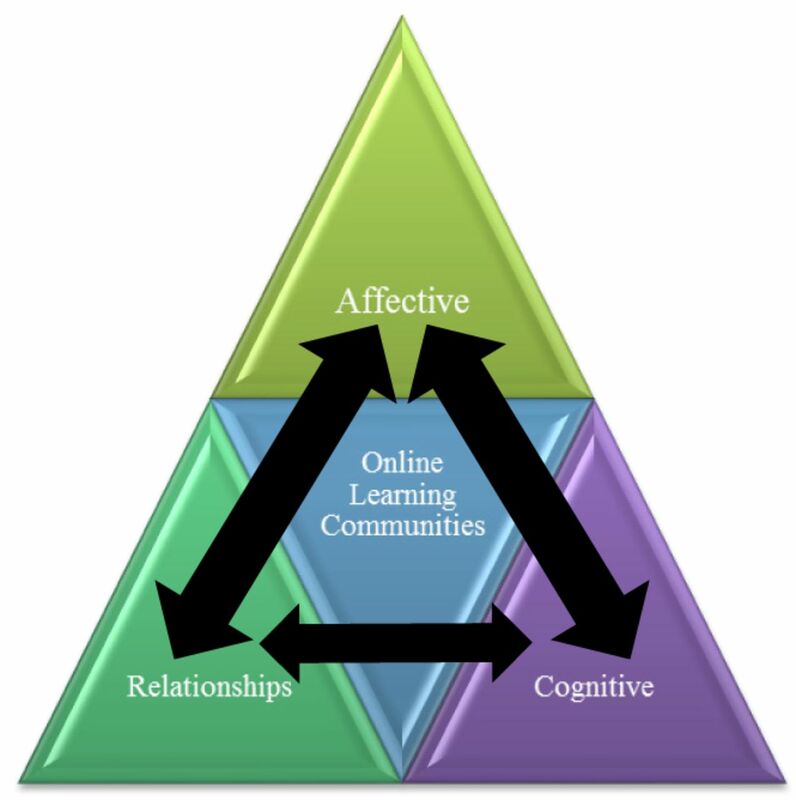 The second interrelated key element in the e-model consists of the metamorphosis through the affective domain of online learning communities (Figure 3). Krathwohl et al created a hierarchy of emotions, values and beliefs, from the simplest level to the most complex.24 The simplest level, receiving a phenomenon, was revealed as the novice graduate students engaged in online activities and developed an awareness of the learning community phenomenon by interacting with peers and faculty. This level also involved becoming conscious of the online culture and its rules of communication and standards of performance. Students entered the next level of the affective domain, responding to the phenomenon,24 when they actively engaged in the learning community by applying the cultural norms, being open to developing relationships and being satisfied with their contributions to learning. Valuing the phenomenon, the third level of affective development,24 was evidenced by students attaching a worth to the online community, demonstrating a belief that collaborative learning was important and committing to the community as an investment in their learning. Furthermore, the valuing level was important for believing that peers' and faculty's diverse experiences provided enriched opportunities for learning beyond the knowledge gained from textbooks. A community placing value on commitment enhanced motivation of its members. 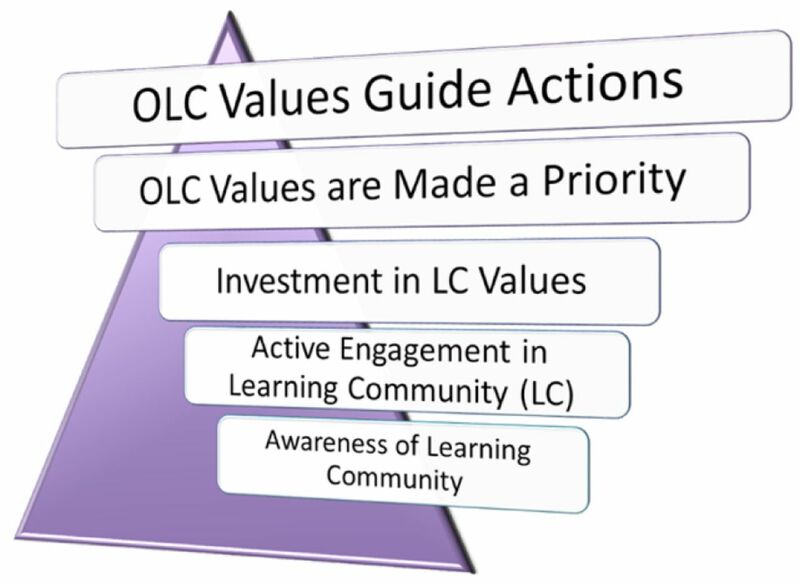 The fourth level in the affective domain required students to organize values into priorities and create a unique values system.24 Prioritization involved spending time and effort in preparation for in-depth postings and collaborative interaction. The unique values system related to the emphasis on synergistic learning, which inspired and aroused excitement in the enhanced status of learning achieved by the community. Characterization was the most complex level of emotions, values and beliefs requiring students to internalize the value of a phenomenon, thereby guiding their actions.24 Internalization of the value of the formal learning community directed the learners' actions to establish informal learning communities when they felt isolated during the independent learning courses in the graduate degree program. The students' ability to establish and adapt to an informal community resulted from their feelings of being comfortable, competent and stimulated from the collaborative learning that occurred in the formal communities. It seems likely that the learners' previous experience was positive and they desired to continue these values and emotions in new situations. The third interrelated key element of learning communities was the metamorphosis through the cognitive domain (Figure 4). 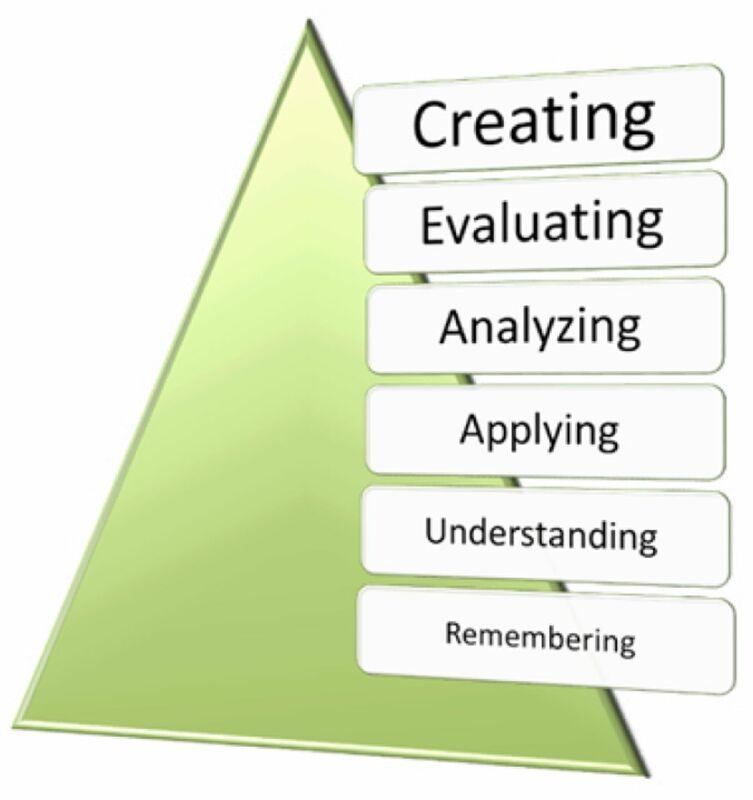 The hierarchy of knowledge shown in the figure was originally developed by Bloom and colleagues in 1956 and was revised in 2001 by Anderson and Krathwohl.25 The simplest level of cognitive domain involves remembering information; whereas, the creating level requires the most complex functioning.25 The core courses of the graduate program focused student outcomes at the analyzing, evaluating and creating levels. During the pinnacle experiences of the learning communities in these courses, synergistic learning was apparent, which coincided with the creating level. Synergistic learning was experienced as the creation of innovative knowledge unique to a collaborative group. This knowledge was built from intensive interaction of the group to outperform the sum of abilities of each individual member. Synergistic learning was the positive energy stimulating the collective construction of ideas both quantitatively and qualitatively. This learning enhanced the level of student performance based on the interaction with synergistic relationships and affective actions. The concept of synergistic learning is supported by Zhu and colleagues who proposed a synergistic learning model as a new framework to explain learning in a technology-based system.26 This learning was characterized by “deep interaction between content and learners,” information sharing, collaborative and cooperative construction of knowledge and “collective thinking.”26 Within the technology system, the interaction of 5 fields comprises the learning field: information, knowledge, behavior, emotion and value.26 It is interesting to note the separation of the emotion from the value field and the inclusion of both within the process of synergistic learning, which corroborates the findings related to the e-model. The 3 key elements of online learning communities are: metamorphosis of relationships, metamorphosis through the affective domain and metamorphosis through the cognitive domain. These were interrelated based on the experiences of students enrolled in an online graduate program. Each element was mutually related to the other 2 elements as shown in Figure 5. Students who reached the higher levels of each hierarchy experienced a relative developmental change in the other hierarchies. Perhaps the most significant finding was the essential role the affective domain had in influencing the metamorphosis of relationships and the cognitive domain. This qualitative inquiry on the phenomenon of online learning communities over the length of a graduate degree program adds an e-model to the scientific body of knowledge in dental hygiene education. The e-model describes a 4 stage process through which learners experience a metamorphosis in their affective, relationship and cognitive development. Students' experiences in Stage 1: Building a Foundation for the Learning Community, provided the groundwork for learners to progress to Stage 2: Building a Supportive Network within the Learning Community. Advancement to Stage 3: Investing in the Learning Community was facilitated by the experiences in Stage 2. The final stage was Transforming the Learning Community to an informal network of colleagues as students completed the curriculum and focused on their personal professional development and anticipated careers. The e-model represents the ultimate experience with learning communities in a graduate program. Learners advanced through the stages at different rates; however, it was difficult for students who remained independent learners to progress to Stage 3 and 4 as they did not value being open to building relationships and creating knowledge as a collective community. The most influential key element contributing to the learners' evolution through the e-model was the affective component. The affective development generated informal learning communities from the value of formal learning communities. Lifelong collegial relationships extending beyond the academic program were formed. Synergistic learning in the cognitive element was possible based on the interaction between synergistic relationships and affective actions. Online graduate programs present many challenges to students; however, engaging in formal and informal learning communities provide the means to being productive learners. Students struggle through their coursework, but when they have the support of learning communities and develop competence and confidence navigating these challenges, they can be successful. Learning communities are similar to the chrysalis in which the butterfly develops fully surrounded by a supportive structure. The butterfly must struggle out of the confining chrysalis as a necessary process to build strength in its wings in order to fly. Learners also must struggle to emerge from the chrysalis, to strengthen their wings to fly and to begin new lives as independent, self-motivated and self-sufficient professionals. Ellen J. Rogo, RDH, PhD is a Professor and a graduate faculty member in the Dental Hygiene Department at Idaho State University in Pocatello, Idaho. Karen M. Portillo, RDH, MS is an Assistant Professor and Community Outreach Coordinator in the Dental Hygiene Department at Idaho State University in Pocatello, Idaho. This research was funded by the ADHA Institute for Oral Health.
. Nontraditional students online: composition, collaboration, and community. J Contin Higher Educ. 2012;60:33-39.
. Strategies for creating community in a graduate education online program. J Computing in Teacher Educ. 2007;23(3):81-87.
. Students' positive and negative experiences in hybrid and online classes. Coll Student J. 2007;41(1):242-248.
. Building and sustaining community in asynchronous learning networks. Internet Higher Educ. 2000;3:285-297.
. Building online learning communities in a graduate dental hygiene program. J Dent Hyg. 2014;88(4):213-228.
. Does a sense of community matter? An examination of participants' perceptions of building learning communities in online courses. Quart Rev Dist Educ. 2007;81(1):9-24.
. The process of community-building in distance learning classes. J Asynch Learn Networks. 2001;5(2):18-35.
. Nursing student perceptions of community in online learning. Contemp Nurse. 2009;32(1-2):133-146.
. Constructing grounded theory. Thousand Oaks, CA. Sage Publications Inc. 2006. p 208.
. Mind in Society: The Development of Higher Psychological Processes. Cambridge, MA. Harvard University Press. 1978. p 159.
. Critical inquiry in a text-based environment: computer conferencing in higher education. Internet and Higher Educ. 1999;2(2-3):87-105.
. In a Different Voice. Cambridge, MA: Harvard University Press. 1982. p 184.
. Women's Ways of Knowing: the Development of Self, Voice, and Mind. New York, NY: BasicBooks, Inc. 1997. p 256.
. Connected knowing in a community of inquiry. Proceedings of the 23rd Annual Conference on Distance Teaching & Learning, Madison, WI.
. Social capital theory: implications for women's networking and learning. New Direct Adult Contin Educ. 2009;112:3-12.
. Building social capital in the academy: the nature and function of support systems in graduate adult education. New Direct Adult Contin Educ. 2009;112:43-52.
. Emotion and e-learning. JALN. 2003;7(3):78-92.
. Adult learners' emotions in online learning. Dist Educ. 2008;29(1):71-87.
. Role adjustment for learners in an online community of inquiry. Inter J Web-based Learn Teach Techn. 2007;2(1):1-16.
. Emotional presence, learning, and the online learning environment. Int Rev Res Open Dist Learning. 2012;13(4).
. Taxonomy of Educational Objectives, the Classification of Educational Goals. Handbook II: Affective Domain. New York: David McKay Co., Inc. 1973. p 196.
. Taxonomy for Learning, Teaching, and Assessing. New York, NY: Addison Wesley Longman, Inc; 2001. p 302.
. Synergistic learning for knowledge age: theoretical model enabling technology and analytical framework. Info Techno Educ Change. 2012;3(1):147-160.
. Laying the groundwork for the development of learning communities within online courses. Quart Rev Dist Educ. 2002;3(4):395-408.